The ultimate streaming, gaming, Android TV device? Nvidia has finally announced the Europe-wide availability of its SHIELD 4K Android TV console starting from tomorrow, October 1. The powerful little set-top box has been available in the US since early this Summer and we've been waiting to get our hands on it this side of the pond. Nvidia has taken this time to make sure that all the Europe-specific content and services are available for its unveiling in the Old World. We're still getting the same device as the US version, rocking the latest Android TV operating system, so you can expect all the applications we've seen in the latest Sony 4K TVs to be present and correct. Unfortunately Android TV is still a little lacking in the app department, but the main media apps are there, including iPlayer and 4K Netflix. And in terms of media it's a fantastic device - no other set-top box can offer the same level of 60Hz 4K Ultra HD playback the Tegra X1 processor in the SHIELD can manage. Even the new Amazon Fire TV, with its 30Hz 4K limitations, can't keep up. So, as a device to make your dumb, cheap 4K TV much smarter the Nvidia SHIELD is a winner...so long as that dumb TV has got a HDMI 2.0 / HDCP 2.2 connection anyways. 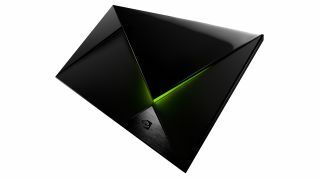 Gaming though is one of the biggest sells of the Nvidia SHIELD and that Tegra X1 processor, with its 256 core Maxwell GPU (the exact same architecture which powers the mighty GeForce GTX Titan X), is a mighty gaming beast and no mistake. It comes with Nvidia's controller (a very Xbox-a-like pad) and three months of free access to the new GeForce NOW streaming service. You can also play a host of Nvidia-optimised native games, like Half-Life 2, and stream games from your Nvidia gaming PC right into your living room. The Nvidia SHIELD is available from October 1 for £149 for the 16GB version and £229 for the 500GB SHIELD Pro. It comes with the controller as standard, but because you can program your TV's remote to operate the SHIELD the bespoke remote is an optional extra. As does the super-sticky stable stand. Those two are priced at £40 and £25 respectively.